Advertisers want the perfect targeting that is offered by programmatic advertising. And why not? “Just let the algorithm do it,” they say. “And it would be nice if no more advertising sales people would call!” Alas, it is not to be. The most alarming estimates are that only a quarter of digital spending reaches its target. There are many estimates, none are comforting. A lot has changed since the early days. Many levels of fraud protection, simplest and most obvious being the IAB’s “dot-Text” clearinghouse to assure ads are placed only on legitimate sites, not spoofed sites. But one thing has not changed, only grown: the amount of money available to successful cheaters. With hundreds of billions of dollars flowing through the system, finding a way to skim off only a little bit is big money. Organized crime has organized itself to do it. And klepto-governments have utilized the system to finance their own shadowy dis-information campaigns. Big money available, means big shadowy tech aimed at siphoning it. Where once, a fraudster, or dirty trickster like Roger Stone, had to pay money to have flyers or faked-up newspapers printed and distributed to distribute their misinformation, or rely on inefficient, old-fashioned, word-of-mouth, now the same cheaters can create fake news and earn revenue while they simply make up stories and headlines, or seed Fear, Uncertainty and Doubt, and worse. Just make a fake web-site, drive traffic with outrageous social media posts, and plug into the real-time-bidding advertising universe. Viola! Money in the bank! The system is part of the problem. Many believe that ever-smarter Artificial Intelligence can stop the fraud. 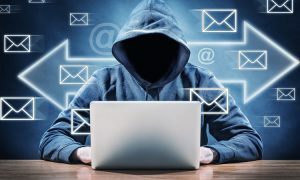 But with as much as 20%, some say as high as 30% of advertising being fraudulent, that’s billions of fraudulent revenue at stake, the bad-guys are working their AI, too. The AI arms race won’t end, just get more sophisticated. Columbia Journalism Review recently covered a so-called entrepreneur who built the “BreakYourOwnNews” dot com. It is just one example of how human ingenuity creates new ways to cheat and cloaks it in a platitude about “democratizing” media. Advertising sales people for legitimate media must establish the want and need to avoid fraud, and for advertisers to advertise in trusted environments, as a key assumption of their sales persuasion. Use “challenger selling” by asking a customer choose between two alternative brands. Trust is a big part of it. Advertisers don’t need advertising to win with price. Advertising works through trust. No trust; no transactions. 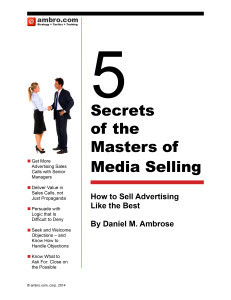 Traditional media must utilize better sales practices. Digital media emphasizes the need for targeting to reduce waste, and social media to replace old-fashioned word-of-mouth. Traditional media must emphasize the need for trust before targeting. Ask power-questions that get the client thinking about the importance of trust. Then ask questions about how the client builds trust-building into their marketing efforts. Trust me, it will work to spark more sales.